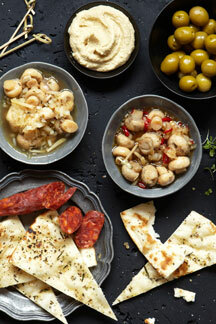 Looking for something different for your charcuterie or meze platter? Then add these crunchy marinated button mushrooms to the mix. They are tangier than artichokes but not as sharp as pickles. 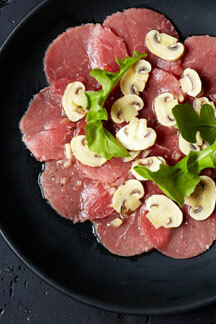 Pop one in your mouth and chase it with a piece of Parma ham – heaven. First we boil these button beauties in our tangy syrup, then marinade them in a delicious sweet-and-sour vinaigrette along with hand cut garlic and onion. 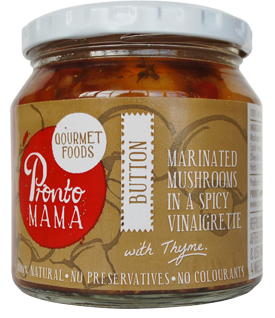 The addition of fresh thyme gives it a wonderful Mediterranean flavour that also makes our marinated mushrooms great in pastas, pizza toppings and salads. 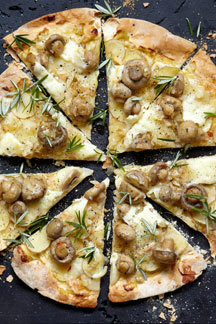 Tip: use the vinaigrette as a salad dressing when the mushrooms are all gone. Bonus! Ask us about catering sizes and bulk orders. Storage: Refrigerate after opening and use within 4 weeks.